We are all familiar with how oxidation works. Iron produces a reddish brown flaky layer, aluminum produces white flakes, and apple turns brown when exposed to the air and moisture for some time. Just like these examples, copper also undergoes oxidation. But unlike iron, which turns to rust when exposed to air and moisture during oxidation, copper turns to green when exposed to oxygen. Water, in this case, is not necessary for copper to oxidize. In fact, copper does not react with water at all. Copper’s original color is described as peachy or pinkish with a metallic luster. It only turns green when it oxidizes. So why does copper turn green when it oxidizes? During oxidation, the element loses electrons, usually hydrogen, when it interacts with another element. In the case of copper, it reacts with the oxygen in the air and forms copper oxide which is colored green. This copper oxide forms a coating, or what is called as “copper patina,” on the surface. The patina actually forms a protective layer around the copper. This oxidized layer prevents further oxidation that might lead to total corrosion. Copper’s resistance to corrosion is the reason why it is considered a very important metal. The patina also serves as a waterproofing layer, which is often seen in copper roofs and pipes. What Else Makes Copper Change Color? Aside from oxygen, copper can be oxidized after being exposed to chemcials. To produce a nice antique patina on copper, try the following tips from Finishing.com members. Mix the solution carefully and then bathe the copper parts. Let the solution dry on the copper surface. For that rich deep brown patina, a treatment of Liver of Sulphur (Potassium Polysulphide) while being heated is enough. The Liver of Sulphur is often sold in the form of solid dry stones. One stone dissolved in water is enough for a 600ml solution. Put this in a spray bottle and apply to the copper surface while you heat it up with a torch. When you have finished spraying the surface, gently rub down the surface with a wet scourer until you bring out an even light brown color. Then reheat the surface while applying a weak Ferric Nitrate. This will richen, redden and darken the brown that was brought out using the Liver of Sulphur. When finished, coat the surface with either floor wax or clearcoat. 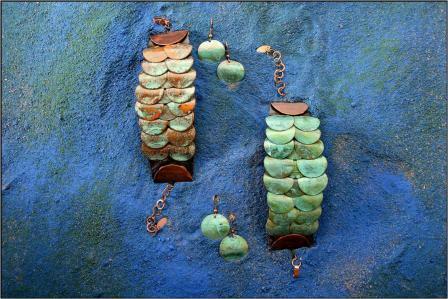 Copper patinas are in varying shades of green, blue, red, and brown. It’s fun cheating time and creating these colors using chemicals. Some people have suggested using bleach. However, be careful not to mix dangerous chemicals with bleach. This can produce noxious gases that may poison anyone in the room.